Jan 29th, 2019 - In a recent customer-requested test application, UltraFlex Power Technologies proved the efficiency of de-brazing and re-brazing carbide tips onto milling cutter tools using an induction heater. UltraFlex manufactures the most advanced digitally controlled induction heating solutions in the industry and its engineers were confident that induction heating would reduce the time needed for worn carbide tips replacement in this customer scenario. 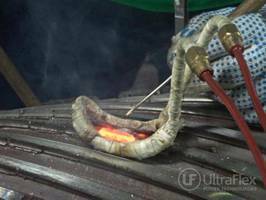 To set up the test app, a 5-15 kW Induction Heating solution from the UltraFlex UltraHeat W Series had been used to supply power of up to 11.5 kW. UltraHeat W induction heaters are advanced, cost-effective 5-15 kW Induction Heating systems utilizing the latest switching power supply technology. They come with adaptive digital phase control providing very efficient operation in a wide frequency range. Once the induction heating set up was ready, it took 10 seconds for the heater to reach the brazing temperature, allowing the stale tool to be removed and the old solder cleaned. Within another 10 seconds, rebrazing of the new carbide tip was completed. The test proved successful and showed that the power supplied was completely sufficient to accomplish the induction de-brazing and brazing with highest quality. The time and energy efficiency of the induction heater exceeded the customer’s expectations for this test case and showed the suitability of induction heating for lean manufacturing objectives. Which is more, the usage of foot-switch would increase the efficiency even further and improve the repeatability of the process. UltraFlex Power Technologies (ultraflexpower.com) offers the most advanced and innovative digitally controlled induction heaters in the industry. Its compact modular and flexible systems are suitable for a wide variety of induction heating, casting and melting applications. Induction Heater heats bearings, pulleys, and couplings. Induction Heating System is suited for nanoparticle research.